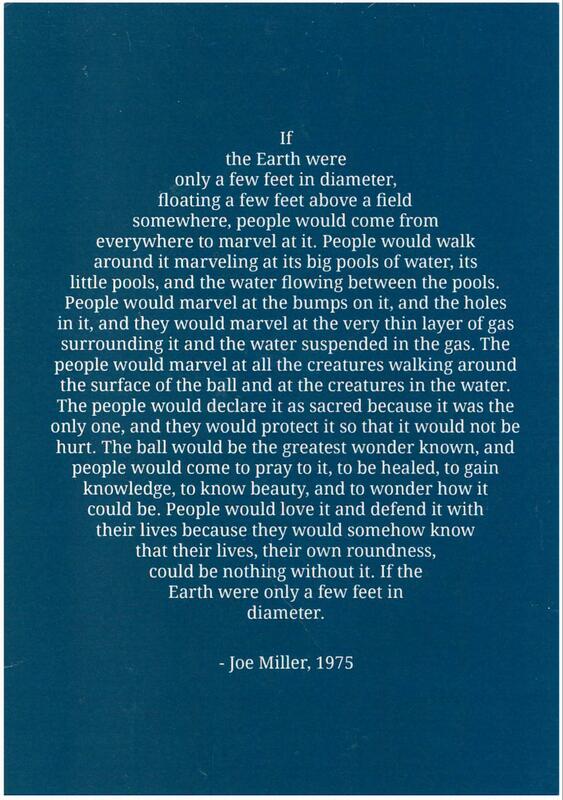 With thanks to the Gaia Foundation who published Joe Miller’s beautiful poem in this format. 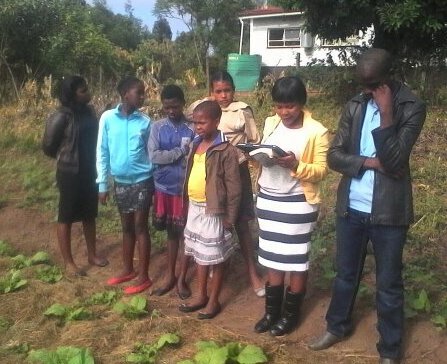 Wednesday March 2 has been a historic day in Manzini Parish, Mathanda when members of the church decided to have a short service under a marula tree which is one of the trees that has cultural significance in the Swazi Culture. We gathered under the tree to share a bit about Climate Change before starting our tree planting around the church. We have been using Season of Creation II for prayers and readings; Rev. 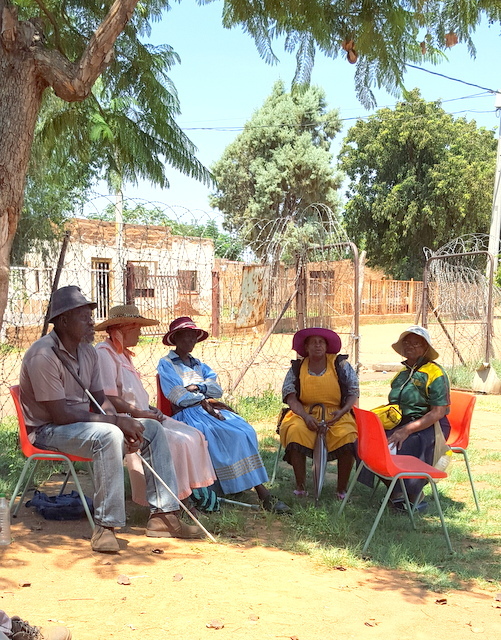 W. Dlamini led us into a brief Bible study and Mncedisi Masuku talked briefly about the scientific aspect of how Climate Change is connected to deforestation and green-house gas emissions, and how tree planting benefits the eco-system balance. After the readings it was discussed how in the gospel of Matthew we see Jesus calming the storm, which shows that Jesus is above all nature. We need to go back to Christ if we are to fight and win Climate Change, as he is the solution and can teach us how to be stewards of the earth. After the short service under the tree, we moved forward and put faith into actions. We planted 31 trees which will serve as wind breakers for the church along the surrounding fence. It was a wonderful experience. We also planted five indigenous plant species that are now at risk of extinction due to deforestation; we are saving them for future generations. We saved one fruit tree to plant at the Good Friday service. The main purpose of the day was tree planting but the service would not be complete if we left litter around the church compounds. It was then decided to do a clean up exercise to leave the church green. Did you know cutting down on meat can save the environment? It is not easy for most of us but cutting down on beef can go a long way in saving our deteriorating environment. We shared a very nice chicken stew and some green vegetable. It was a wonderful fellowship. We are so grateful to the government of Swaziland for providing us with these trees from the Environmental desk. We committed ourselves in taking care of them when we made our last prayer, blessing the work of our hands. So help us Lord. The plans for celebrating Earth Keeper Day on 14 February were announced on the previous Sunday and congregants were asked to bring a gift of the Earth (any vegetable or fruit from their garden or greengrocer) that was to be distributed later to the needy. Many congregants heeded the call and placed their Gifts of the Earth in the sanctuary before the service. The children of Waterkloof Primary School also participated by bringing canned as well as fresh vegetables and fruit to school on the Friday. The children, as well as their parents and teachers, also joined our annual clean-up of a spruit in the vicinity of the school. So the Earth Keeper message was spread through the community. At both services on the Sunday the Benedicite Africana (Song of Creation) was used as well as a Eucharistic prayer for the Season of Creation, which was combined with the liturgy for the First Sunday in Lent. At the second service, which was attended by the Sunday School children, the Rector demonstrated how we are polluting the Earth by emptying a dustbin down the aisle. The children had drawn posters to celebrate the day and these were on display in the church. Dropping off the Gifts of the Earth at Itereleng Centre. 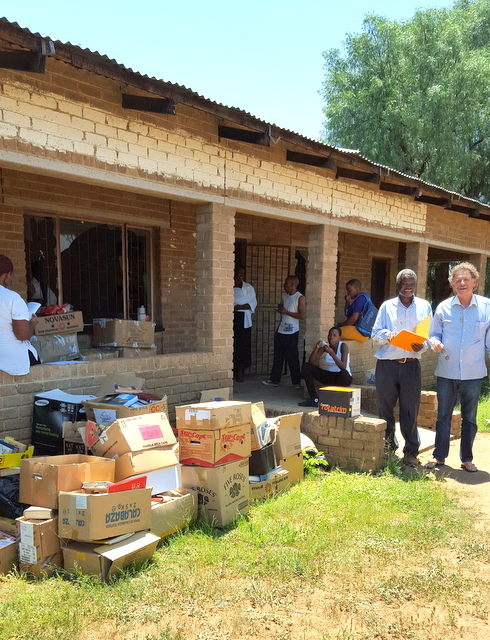 On Monday, two vehicles filled with vegetables and fruit went to Itereleng Centre, in Winterveldt, a cluster of settlements to the north of Pretoria. Itereleng was established as a training centre for the disabled in the former Bophuthatswana. It is still frequented by the elderly and the disabled, but the infrastructure is in a state of disrepair and it seems that training is no longer given on a permanent basis. 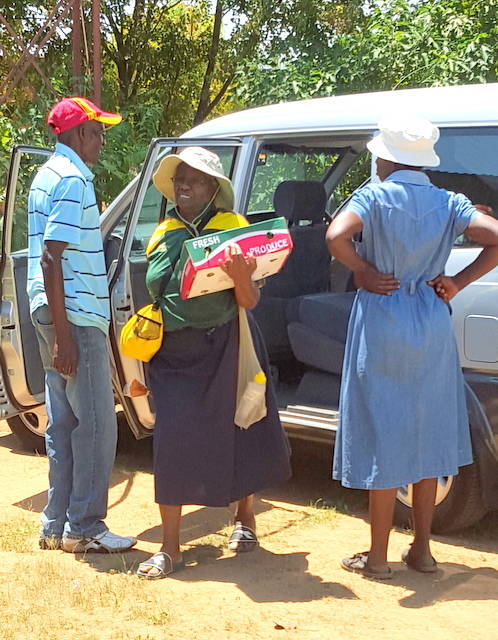 It is not a project of Tumelong (the mission and development programme of the Anglican Diocese of Pretoria), but it does receive occasional help from them and from various other organizations in Gauteng and North West. It is also supported by the local community – several residents in the vicinity agreed to store and cook the produce donated by the church. Residents at the Itereleng Centre receive fruit and vegetables from St Francis of Assisi Anglican Church. Residents at the Itereleng Centre. 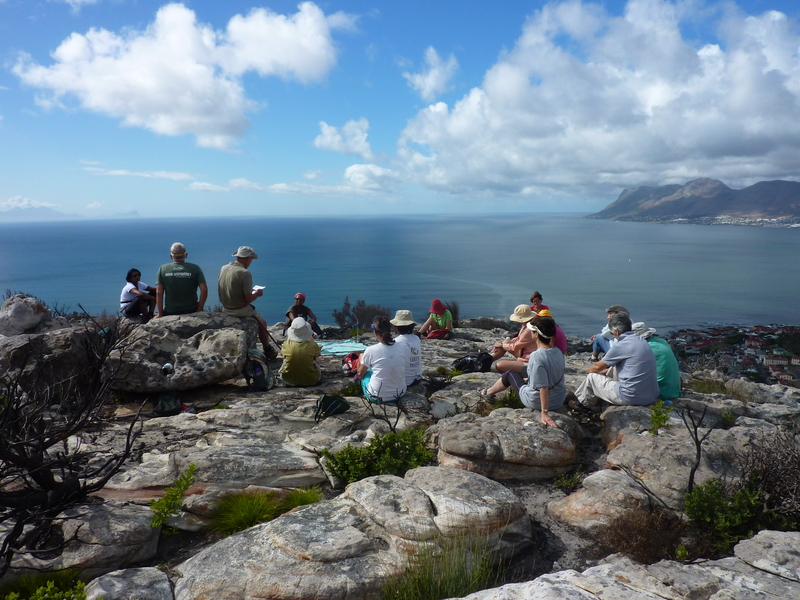 Earth Keeper Day service on Kalk Bay mountains. How can we reclaim the inherent mystery that belongs to all of creation, while living in a throw away culture that has covered this wonder with waste? How can we return to a magical world, one that we have made toxic with our greed and desires, with our addiction to consumerism? 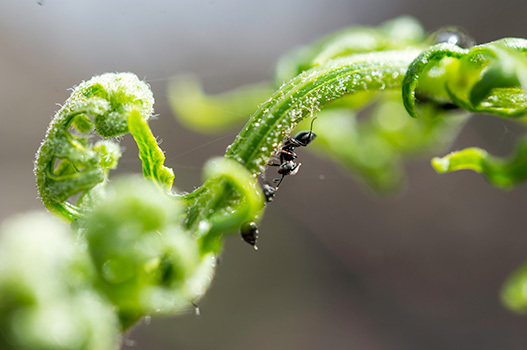 Could it begin with something as simple as recognizing that we are not separate from the Earth, but, breathing its air, sustained by its food, nourished by its beauty, we are part of this miracle? 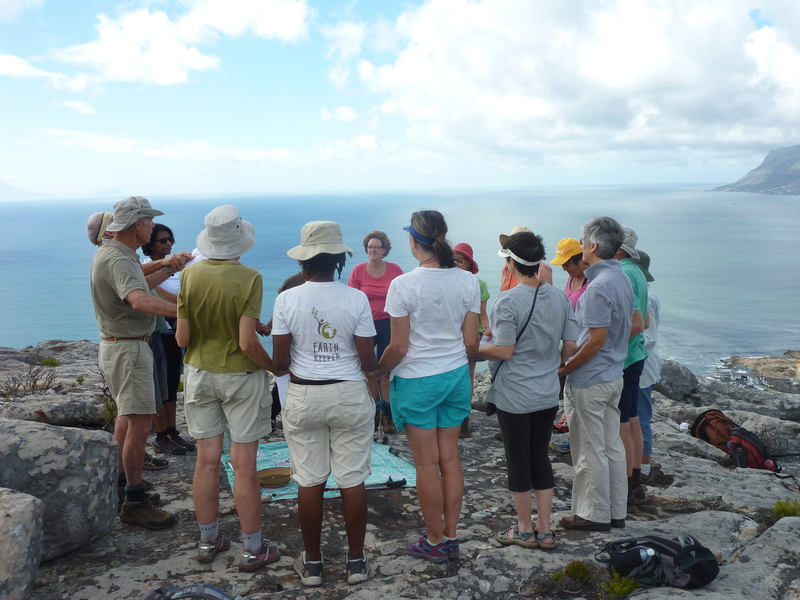 Earth Keeper Day service on the Kalk Bay mountains. Wisdom words from Llewellyn Vaughan-Lee’s ‘Shifting the climate debate onto sacred ground’, framed the thinking behind a meditative Earth Keeper Day celebration on a rocky outcrop overlooking False Bay on the Kalk Bay mountain. Using a mandala and the universal symbolism of the life-giving elements of earth, water, fire, wind and space, a shared thanksgiving service for the gifts of smell, taste, sight, touch and hearing linked a diverse group of Christians, seeking sanctuary. As silent participants, we gazed out over the bay, looking down on the Saturday morning busy-ness in the human settlements below. Meditations by ‘geologian’, Fr Thomas Berry, drew us back to the centre and guided silent reflections on our inter-dependence and connectedness with the world around us. The universe is a communion and a community. the air and the water and all living forms. Humans are woven into this larger community. The large community is the sacred community. 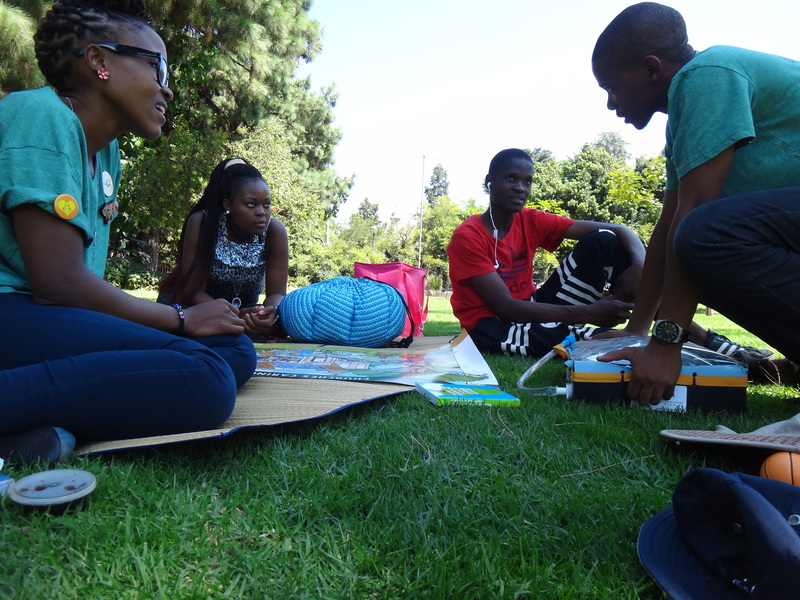 SAFCEI staff in Tshwane celebrated Earth Keeper Day on Saturday 13 February in Burgers Park. SAFCEI’s Lydia Mogano reflects on the event. 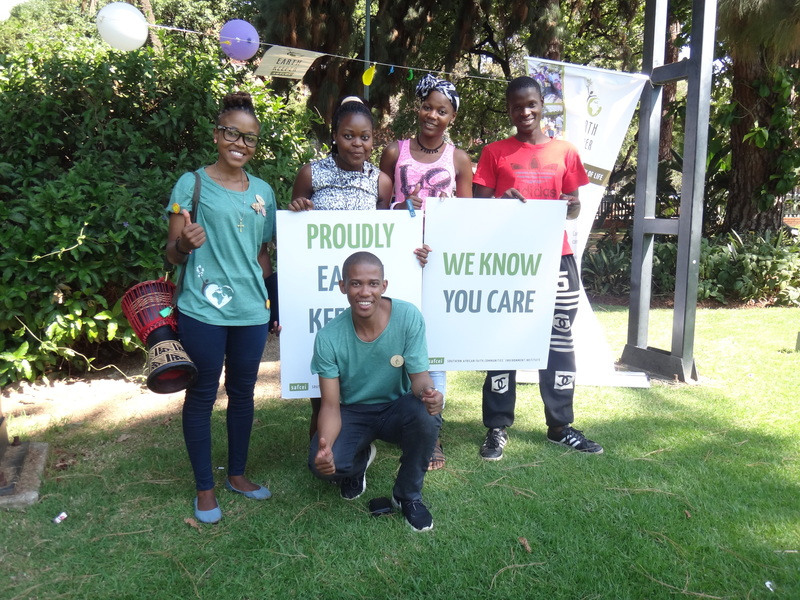 SAFCEI celebrates Earth Keeper Day in Burger Park. 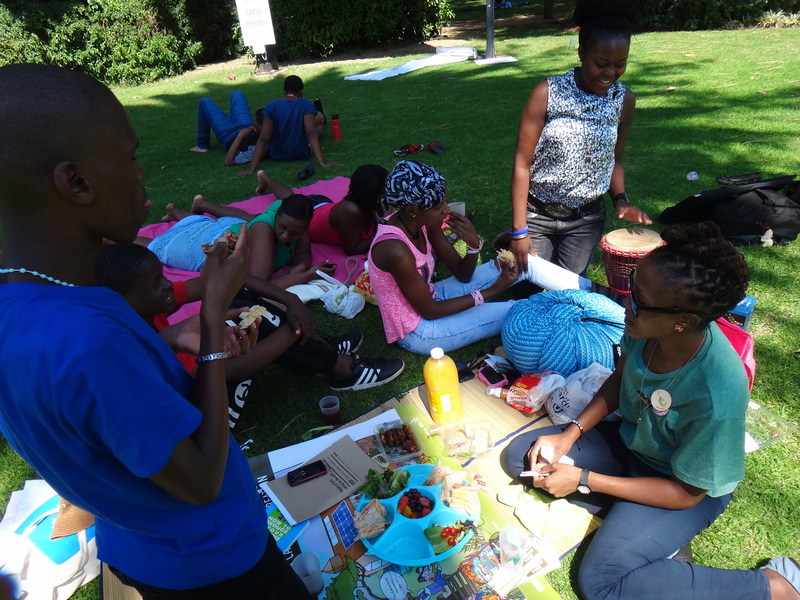 We spent our day at Burgers Park chatting with ordinary people about our connectedness to the earth and the pragmatic value taking care of the environment. We started off with fun ice breakers and energizers to get to know each other better. Then we migrated from superficial discussions about littering to deeper discussions about the meaning of environment (in the context of claiming space, responsibility and Ubuntu). We expanded the topic to include waste, enjoying free basic rights such as clean water and air as well as recognizing that environmental awareness and action does not necessarily belong only to the scientists but it is knowledge and action that anyone can do anywhere. There is a general perception that the youth are ignorant but clearly our group was not. They stressed that one of the problems they have with tackling environmental issues is because behaviour change often stimulates a negative feedback from community members, especially when their actions are unsustainable. Therefore the environmental job market is not always attractive. Then we explored various practical behavioural adjustments we could apply at home to save water, electricity, and reduce household waste, carbon, as well as in minimizing flood and storm impacts through tree planting and redesigning landscapes to adapt. For instance, Tsepo showed how one can save both electricity and water by using a solar geyser. I showed how we could save electricity and water (or wood/charcoal if one is unable to afford electricity) by using a wonder bag. Moreover, we learnt more about the potential potency and impact of carbon in the atmosphere through a science experiment and we talked about a great Renewable Energy potential that exists for young people to explore and innovate. Conducting eco-audits (e.g., of water and electricity) can give congregations and households an opportunity to be aware of their consumption and then encourage further sustainable behavioural adjustments more effectively. Since our country has been experiencing heat spells and water shortages, this exercise can make big difference if everyone plays their part. 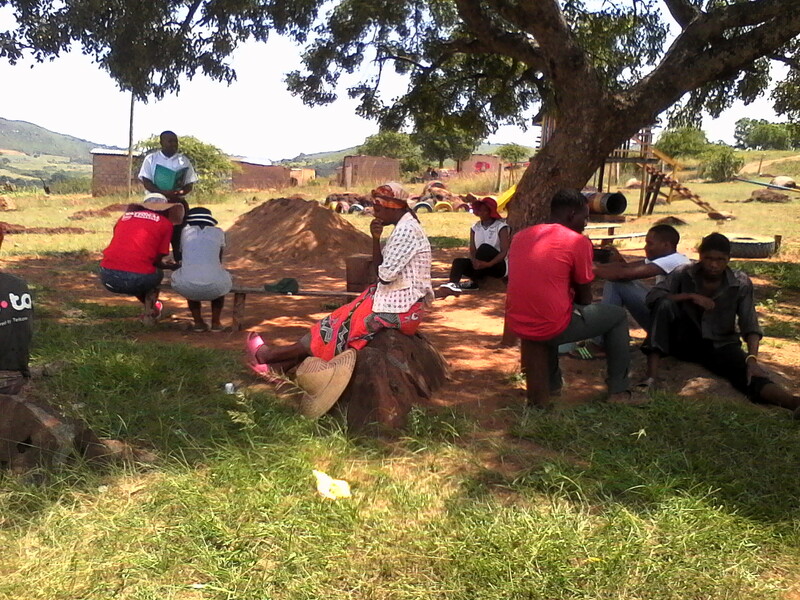 “We don’t usually pay for water in rural areas back at home, so we might not need an audit” said Ouma, one of the youths. Although the concept of conducting “audits” may usually have strong financial connotations, we should also look at it the context of our consumption patterns and more importantly, sustainable living should continue to enable free access to safe drinking water for everyone while addressing climate change. All of these not only improve the environmental health, but also improve our own physical and psychological well-being. One of the participants endorsed this point by pointing out the value of enjoying good quality air in the Park and that it should also be enjoyed at home. We ended off with singing local gospel songs and a prayer thanking God for the blessing we have in creation as well as His everlasting love, grace and provision. Overall, I was surprised at how much we spoke on so casually in a few hours and was inspired to hear Daniel, one of the youths say: “At least I am not completely in the dark!” Our group enjoyed our discussions and related activities and they wanted to be involved. They wished that such initiatives could be spread further into their communities. 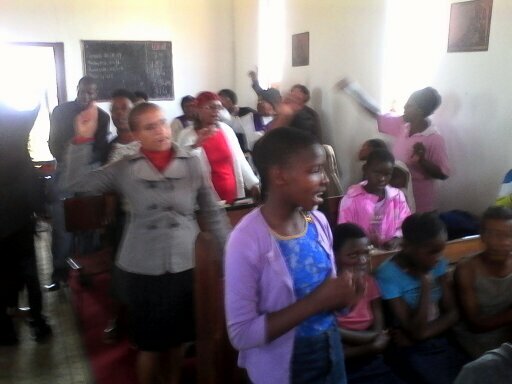 The Anglican youth of Hlathikhulu Parish in the Diocese of Swaziland had a Green Valentine weekend. We began the weekend on Friday 12 February with an evening song before going to bed in preparation of a busy day on Saturday. Saturday began with a morning prayer in our church backyard vegetable garden. It was a refreshing experience to enjoy the presence of God outdoors in the beauty of nature looking on the planted vegetables. Our first session was facilitated by Mr. M. Masuku and he talked on Climate Change and Eco-Justice. He explained how green house gases emitted by human activities have led to climate change and how it has affected world temperatures and rainfall distribution. He then gave some effects of Climate Change in food production in Africa and how the future is projected to be if no actions are taken. This presentation was an eye opener and it provoked questions and discussions that even tried to address the role the youth and the church can play in influencing the justice system of the country especially on the subject matter. Swaziland Environment Authority (SEA) delegates were part of the discussion and gave the youth an assurance that they are ready to listen to their issues on environmental affairs. Thereafter, SEA took the stage and made a presentation on their role as an organisation on environmental issues in the country. Areas of interest for the youth were education and project implementation. 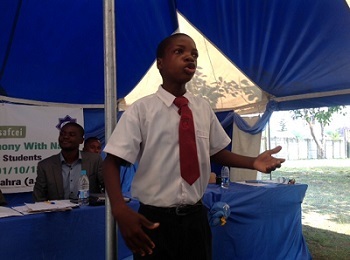 The organisation also promotes Eco-clubs in schools and as the Anglican Church has numerous schools in the country, the youth decided that their next action after the conference was to implement Eco-Clubs in Anglican Schools. The Parish sealed its relationship with SEA by planting an Avocado tree which will be a permanent symbol and reminder for their commitment to be Earth Keepers. 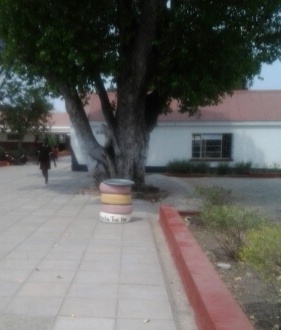 This tree will also be a source of shade for the church and shelter for other animals, food and plays a role in reducing the carbon footprint in the environment. After lunch, Rev. M. Simelane gave a presentation, “The theological aspect of the Environment”. A lot was discussed but to mention a few he stated that the church or people have developed at a very fast rate such that they are far ahead of God whereas God is still in the beginning where he said it is good. If the church is to deal with environmental issues, it has to go back to the beginning where God is. It was said that God loves nature and whenever he revealed himself it was through nature (Moses and burning bush, the dove when Christ was baptised) and even God the Son is at times described through nature (root of David, rock of ages, Lion of Judah). In discussion it was stated that God is not happy if nature is not taken care of and is a sin in His sight. It is the duty of the church to take care of nature and to question the state when it is not doing well, as much as the state has the duty to question the church. After this presentation the youth went into town and informally were picking up litter along the streets raising awareness that Hlathikhulu should be kept clean. After town the youth did some landscaping. The youth felt the need to keep their church looking good thus they planted flowers around the church. In moving forward on their review for the conference, they stated that they need another workshop that will involve different stakeholders including government representatives. 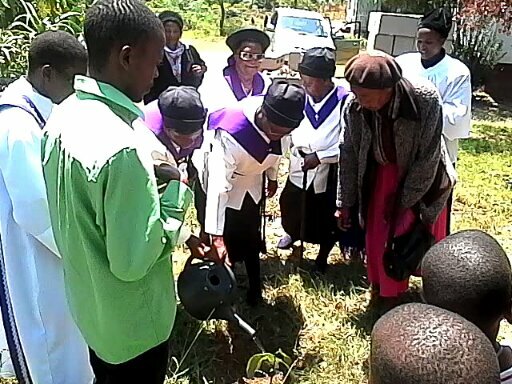 After the service the non-youth and Sunday school church members were given an avocado tree to plant as a way of committing themselves to journey with the youth in being Earth Keepers. 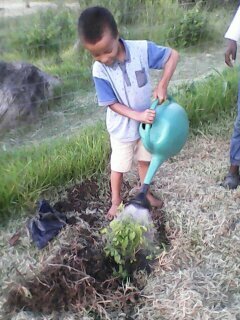 The youth also planted their own avocado tree, committing themselves to the Young Green Anglicans Ministry. 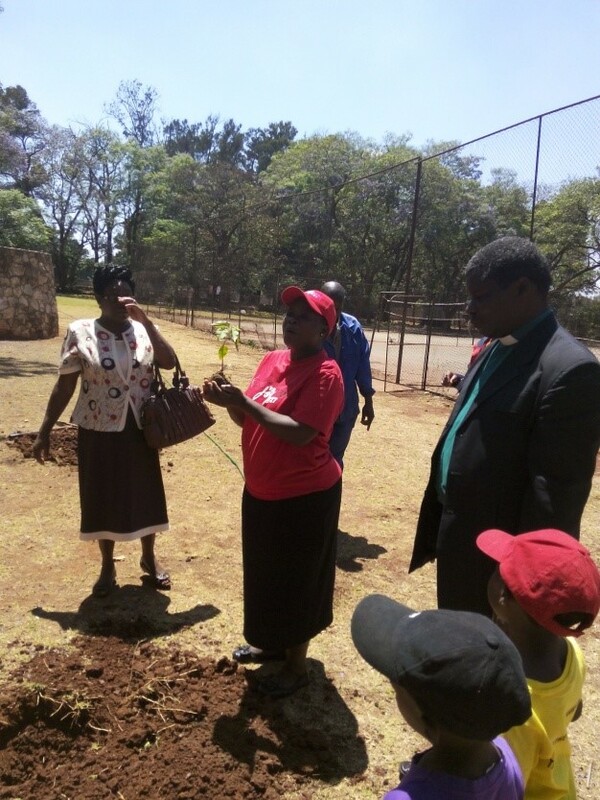 St. Michaels and UNISWA Anglican Chapels held the same on Sunday and had their own trees to plant. 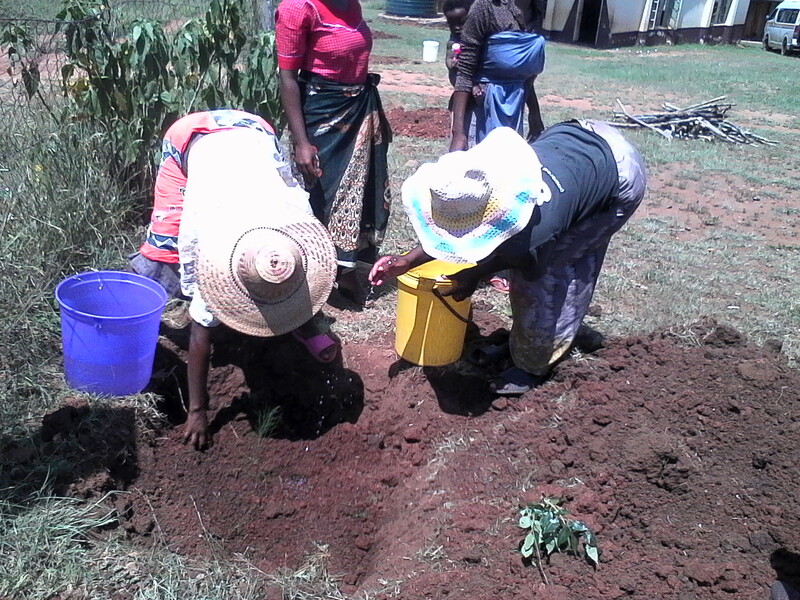 Manzini Parish is yet to plant their own tree. We are grateful to the Wilson Family of St. Antony’s, Anglican Youth Guild and Diocesan office for assisting the Parish with resources to run this conference and SEA for availing themselves in our conference. A special thank you to Rt. Rev. E.N Wamukoya who sponsored the trees and flowers, what a green Bishop. We are looking forward in our next workshop and activities to implement as we are a green Parish. Are you looking for a special gift this festive season? How about an awe-inspiring 2016 calendar that usefully lists all religious and environmental days, and lunar cycles? The limited edition 2016 SAFCEI calendar celebrates ‘life after fire’. Proceeds from the sale of this calendar will go towards increasing awareness, understanding and appropriate action on eco-justice and climate change in Southern Africa. Printed on lekker, local, high-quality smooth matte recycled paper. Would you prefer to donate money towards a specific SAFCEI project? Click here for more information. 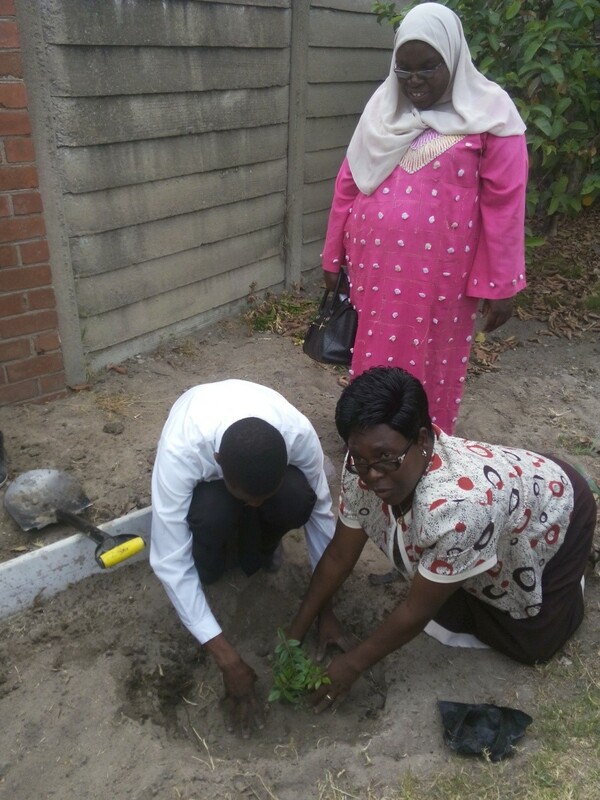 Mrs. Tendai Rebecca Gurupira demonstrates how to plant a tree at Fatima Zaahra Secondary School. 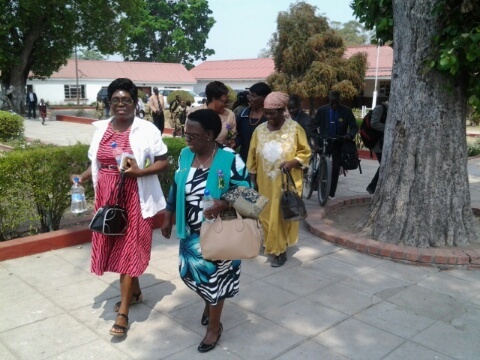 The United Methodist Church continues to give awareness on climate change through the office of the Women Coordinator Mrs. Tendai Rebecca Gurupira. On every church occasion we plant trees. 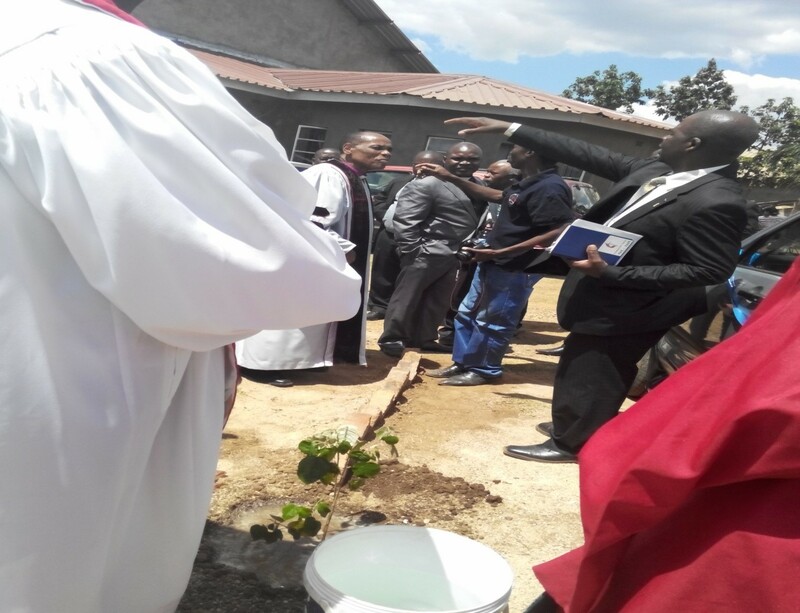 The picture below shows the United Methodist Church Zimbabwe Episcopal Area resident Bishop E.K Nhiwatiwa and Harare West District Superintendent Rev. 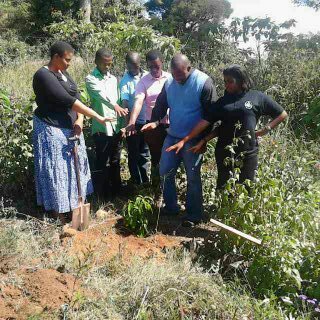 Musharu planting trees after the dedication of Dziwarasekwa sanctuary. The Inner City Circuit of the United Methodist Church held a Family Fun Day function at Alan Wilson School in Harare Zimbabwe. The church asked permission from the school head to plant trees and give awareness on the importance of keeping trees. 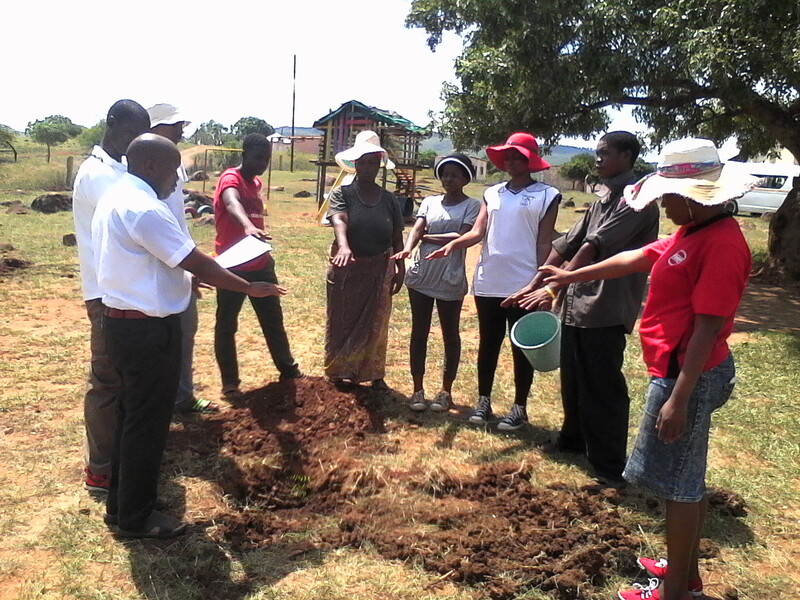 The pastor’s wife Mrs. Chanakira takes a leading role in the tree planting whilst Women’s Coordinator Mrs. Tendai Rebecca Gurupira looks on after demonstrating how to plant trees to the pastors, men, women and children who attended this function. At the latest FLEAT workshop which took place in Zimbabwe from the 28th September – 2nd October, participants were invited to the Fatima Zaahra School for a whole day programme on climate change and living in harmony with nature. The day included drama, poetry and speeches, as well as a tree planting ceremony. Here are the poems that were performed by the pupils. Is this planet the planet I know? Is this the planet Earth? Tendai Gurupira from The United Methodist Church Coordinator Ministry With Women, Children And Youth and one of our FLEAT members took the opportunity of a dedication of one of the classrooms at the Murewa Central Primary School to teach about waste management. She showed the learners how they could make bins out of old tyres. Tendai Gurupira (red dress) at the Murewa Central Primary School. 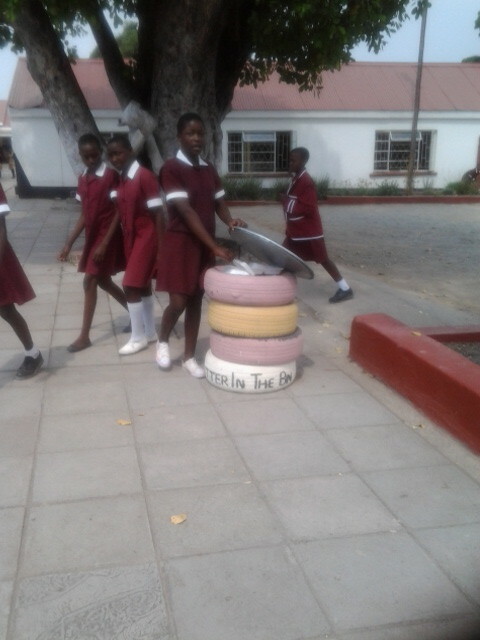 Children at the Murewa Central Primary School make use of the newly erected bins.